Cloud computing is Hot, it's the biggest IT trend of last few years and will continue to grow strong in coming future. Cloud computing provides several not-so-easy-to-ignore advantages, especially to public and small enterprises, which cannot afford to own and maintain expensive data centres. Since most of online business now days need high avaibility, scalability, and resiliency, with-in quick time, it's not possible to achieve all these by your own, and cloud computing becomes a best alternative here. Cloud service providers like Amazon Web Services (AWS) has helped several firms to remain focus on their business, without worrying for IT and infrastructure too much, this has yield big result for them. Not to forget cost effectiveness of cloud computing compared to your own hardware, software and data centres, and with increased competition and awareness of this business, cost is only going to south to make it even more appealing for public and small companies. There are lots of cloud service providers coming up, with increased focused on leveraging expensive data centres to full, many big companies who owns cloud infrastructure are making foray into cloud computing business. In this list, we will see learn 5 Cloud computing companies, which are either market leader or has potential to be a dominant market player. This list includes companies like Amazon, Google etc. If you are a programmer and think that there is no point knowing about cloud computing or not at-least about these cloud computing companies, you are wrong. As an IT professional, one should know about latest technologies and what is going around, when you grow in your career or forms a start-up, your general knowledge of cloud computing and IT platform, infrastructure will help a lot. Amazon's cloud offering, popularly known as AWS is probably the biggest cloud computing company at this time. It is world leader in two of most popular forms of cloud computing Infrastructure as a Service (IaaS) and Platform as a Service (PaaS). Recently AWS announce its move to China, which is going to bring pace to cloud computing industry in world largest economy. Originally started to improve utilization Amazon's expensive data centres, cloud computing is quickly becoming the big revenue driver for company. Amazon built it's cloud infrastructure to support it's well known E-commerce business, but realized later potential in cloud computing. Sometime back Jeff Bezos, the founder and chief executive officer of Amazon, has acknowledged that cloud computing could be the Amazon's biggest business in the future as the demand for cheap computing and storage power keeps rising. Amazon web services is a quite matured cloud-computing Service Provider and it will definitely help to grow this trend in near future. Google Compute Engine (GCE) is biggest threat to Amazon's AWS. Though it remains in limited preview and don't support Windows yet, it could completely change the cloud computing game, if Google chose to. They are very similar to Amazon's AWS but in some respect they even beat them; Like Amazon, Google's cloud infrastructure is built to support their own business mainly for Google Search, Gmail and other products. "In the public cloud, it's going to come down to Google and Amazon," said Floyd Strimling, formerly a technical evangelist at IT monitoring software provider Zenoss, which has a partnership with Google for integration with Google Maps as a visualization tool. "Just like Amazon, they're all in," he said. Google also owns fiber-optic networks, unlike Amazon, which rely on ISPs. Google has been ahead of the software-defined networking (SDN) game as well, and can compete with Amazon on pricing and performance right out of the gate. Fortunately for Amazon, Google has not shown any aggressive intent to dominate cloud computing market yet, but we expect it happens sooner than later, given current IT trends and cost effective advantages of cloud computing. 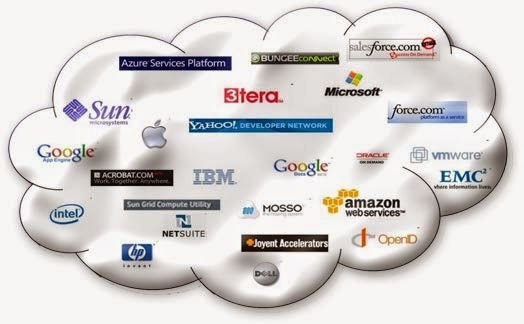 CloudBees is relatively new entrant in cloud computing space and focusing on Java Paas and Continuous delivery area. Unlike many other Platform as a Service vendors, CloudBees seems to be committed on Java, Grails and JRails. Apart from Platform as a Service, CloudBees offers continuous integration services through its Jenkins plugins and also has tie-ups with a number of ecosystem partners, e.g. New Relic for monitoring and PaperTrail for log sequencing. CloudBees seems to be rightly place for small scale companies and start-ups which makes heavy use of Java and open source technologies e.g. GitHub, Jenkins and other third party libraries. The Jenkins plugin is also used by Google App Engine. Rackspace is another growing cloud computing company in Infrastructure as a Service (IaaS) and Platform as Service (Paas) space. Rackspace has played a significant role in developing and shaping OpenStack, the much talked about open source cloud software. It has started offering public cloud service based on OpenStack from August 2012, setting the environment for other major cloud service providers to follow. It still has a long way to go, to even close of Amazon's AWS, but if it continues to broaden to its IaaS managed cloud service offerings as well as evolve to its Pass products for the buzzing DevOps market, it has bright future ahead of him. CloudSigma is a company which thinks that the currently available public clouds are a lot more restrictive than it should be and it aims to facilitate a more flexible and collaborative relationship between public cloud providers and customers. They are not as big as Amazon AWS or Rackspace, market leaders of Infrastructure as a Service (IaaS) offering, but aims to provide an alternative close to customers. The a la carte, or utility, approach to IaaS to configure CPU performance, RAM size, storage size will surely attract many more customers in the future. That's all on this list of some of the top five cloud computing companies and service providers, particularly for Java and IT professionals. Many companies are in business of providing Infrastructure as a Service (IasS) and Platform as a Service(Pass), but there are also companies which provides Software as a Service. Cloud computing is all set to take a big leap this year, and we are likely to see increased competition, reduce price and more attractive packages for using clouds. As IT professional, we should know how IT infrastructure landscape is changing, knowledge of current technology and trends also helps to develop good rapo among peers and colleagues. In 2014, Invest some time to learn about technical changes which can create big impact. Can we have specific app deployment examples as a follow up ? Dude, too biased....Microsoft Azure is now at 2nd place.